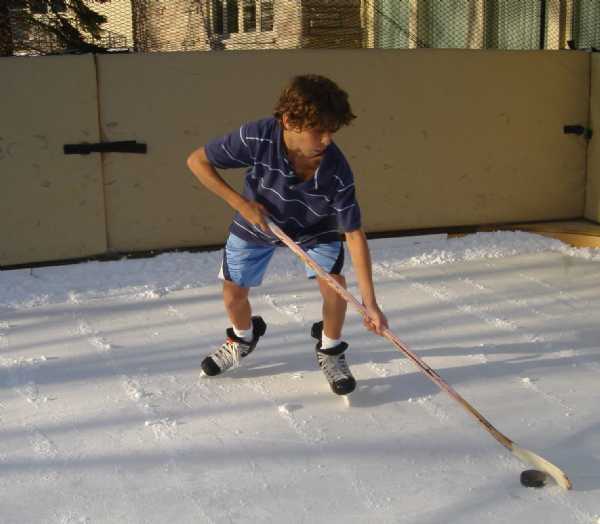 Refrigerated Backyard Ice Rinks: Skate into springtime with backyard ice rink refrigeration. Get years of trouble-free operation and a longer skating season. 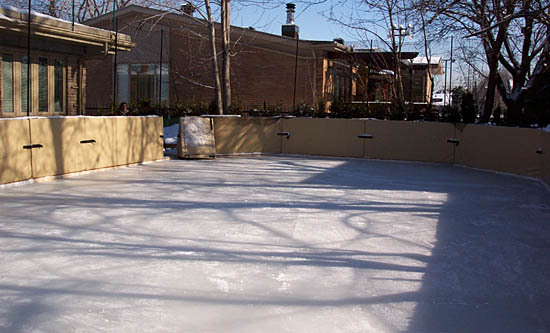 Ice rink refrigeration systems use ice rink chillers, a refrigerant (usually salt water) and pipes under your ice rink surface to keep your ice frozen. 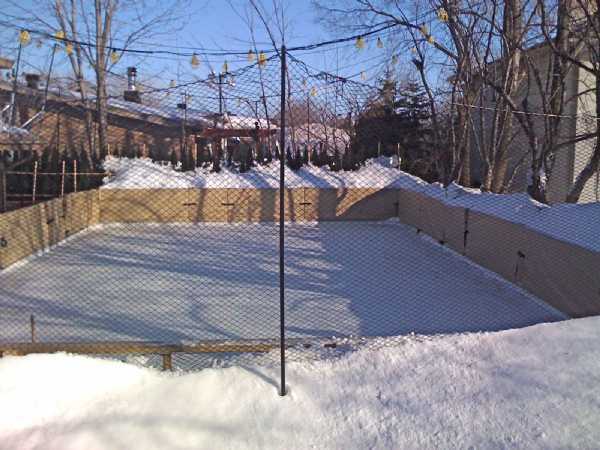 Please see illustration of a typical refrigerated backyard ice rink installation. Nothing beats skating outdoors on a backyard ice rink in the winter time! Skating outdoors on a refrigerated backyard ice rinks in the spring time beats it! It is an unbelievable feeling and absolutely NOTHING beats this! 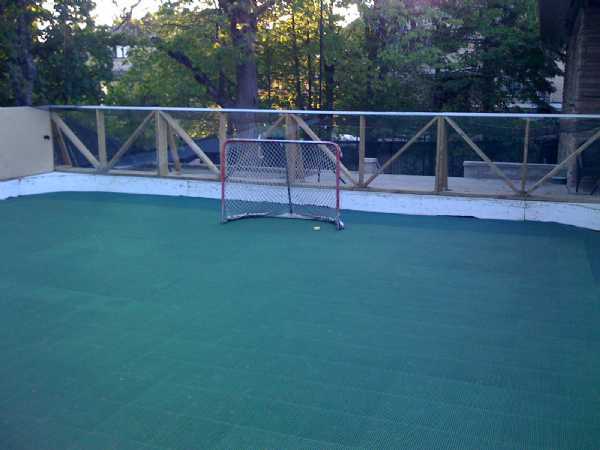 Here is a photo of my friend's refrigerated backyard hockey rink. ... a roller hockey rink surface ! How Ice Rink Refrigeration Works ? Pipes under the skating surface carry super-chilled salt water in a low-pressure gaseous state. The chilled pipes keep the ice chilled below freezing by imparting their cold temperature to the pipes, and then to the ice. At the other end of the ice rink refrigeration system, the compressor accepts the refrigerant, which has been warmed by the ice (if you can call that warm). The compressor compresses the ice rink refrigerant. The extra pressure dramatically increases the temperature of the refrigerant. Note that the compressor does not add heat. The effect of compression is to confine the heat in a smaller space, which then registers as a higher temperature. The refrigerant then passes through more coiled pipes which are in contact with the environment. The heat that the refrigerant had picked up from the ice goes back out into the open air. At the transition from external (pressurized) pipes to under-the-ice pipes is a tiny "expansion valve", beyond which is very low pressure. As the compressed salt water hits the valve, the change from high pressure to low pressure causes it to explode into gas form. This rapid evaporation, called "boiling", drops the refrigerant temperature way below freezing. This is how, as it circulates through the pipes under the ice, the skating surface can remain solid ice even as the ambient temperature noses up into the low 60’s. By collecting the evaporated refrigerant, pressurizing it in a container, which dissipates the excess heat, and then releasing the re-chilled refrigerant back into the ice rink refrieration system, you can repeat the cycle over and over, reusing the coolant and refrigerating the ice rink. Go to Ice Rink Chillers to learn about ice rink chiller refrigeration and portable, flexible tubing grids. 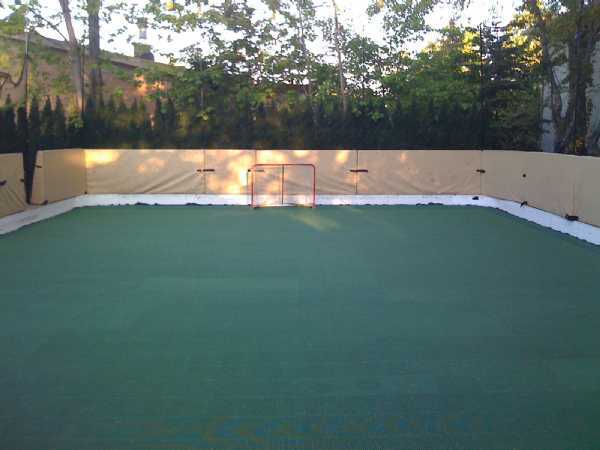 Or Contact Us for more information on refrigerated backyard ice rinks and ice rink refrigeration systems, or for an estimate for your backyard ice rink.